Doug Ford vowed that if he were elected Ontario Premier, it would be lights out for Hydro One CEO Mayo Schmidt. So why didn’t an experienced operator like Schmidt see what was coming? One June morning, just a few days after the 2018 Ontario provincial election, prominent conservative political operative Kory Teneycke placed a call to Ferio Pugliese, executive vice-president of corporate affairs at Hydro One Ltd. Teneycke had just come off a stellar turn as campaign manager to Doug Ford, the newly elected Progressive Conservative premier of Ontario. It had been a sweeping electoral victory in a province previously ruled for 15 years by the Liberal Party. One of the big issues in the election campaign had been escalating electricity rates. The cost of hydro, as electrical power is called in Ontario, had almost doubled over the previous decade for residential customers. Some users of electric heat—including many in rural and northern Ontario—were facing bills of hundreds of dollars a month in the winter, and by the time the March-to-June campaign ramped up, such was the folkloric wrapping around the issue that “skyrocketing hydro prices” had become a rote complaint among voters. 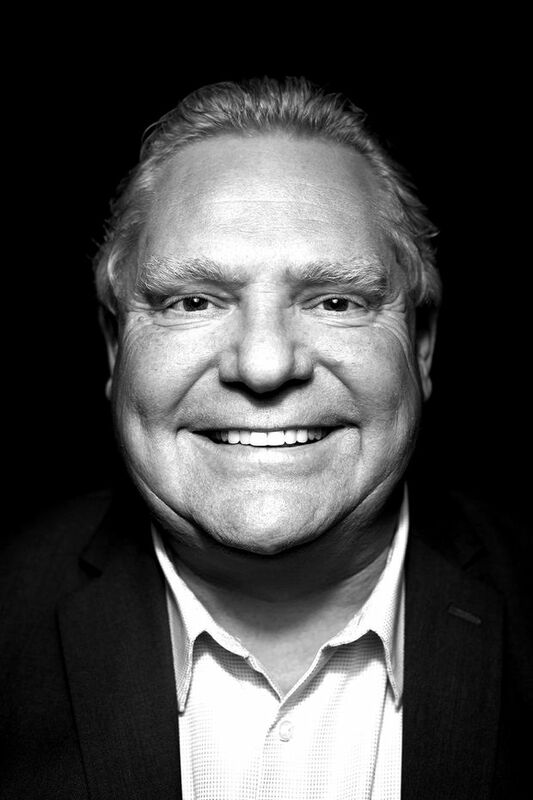 The Ford campaign team had played a steady, threatening drumbeat in the background of its election campaign. Clean up the hydro mess. Fire the Hydro One board. Fire the $6-million man, CEO Mayo Schmidt. It worked: The focus on high electricity rates seemed to tap into a deep desire for change among the electorate, and a growing perception that Ontario was working well for those with political connections and Bay Street influence, but not so much for ordinary people. At the time of the phone call, the leadership of the $12-billion publicly traded electricity transmission and distribution company was distracted, preoccupied with an ongoing $6.7-billion takeover of a U.S. utility called Avista Corp., and annoyed by the negative spotlight cast on the company by the election campaign. There were internal divisions at the board level and in the executive suite about how to deal with the political storm that was brewing. During the call, Teneycke, who had decided to return to private consulting rather than be part of the new government, offered his firm's services to Pugliese. He was prompted to do so by a high-profile Liberal acquaintance, who had been working on retainer for Hydro One and the office of Liberal Premier Kathleen Wynne. The idea was to help Hydro One navigate the hazardous waters of government relations—the very same waters made hazardous by Teneycke and his campaign colleagues in one of the most brilliant electoral gambits in Canadian political history. The call yielded nothing. “I'm not in the business of working against what we were campaigning for,” Teneycke says now. But the unusual exchange reflected the strange and treacherous intersection of big business and retail politics at the heart of the Hydro One story. The storm brewing over hydro rates had been building for years, through the course of several governments. But with an election looming, the issue had really started gathering momentum in March. Rumours were circulating on Bay Street and at Queen’s Park about the large salary increases Hydro One executives had been awarded by its board. Then, on the Thursday before the Easter long weekend, a management information circular for the upcoming Hydro One annual general meeting hit inboxes. Schmidt's total annual compensation had indeed jumped—by 38%, to $6.2 million, part of a larger pool of $14.2 million paid to the top six Hydro One executives. On April 12, Ford called a news conference and took direct aim at Schmidt and the board. “My first act as Premier will be to fire Kathleen Wynne's $6 million dollar man and the entire Board of Hydro One, and restore accountability and trust for the people of Ontario,” he tweeted. Five weeks after his electoral victory, sure enough, the Ford government made plans to pull the newly elected MPPs into the legislature for a rare summer sitting to pass several pieces of legislation, including authorizing the removal of Schmidt and the Hydro One board. The legislation, which would have relied on powers embedded in the shareholder agreement the province had made with the company in preparation for a 2015 initial public offering, showed that Ford's tweet was no idle threat. Schmidt and the board were out. What was astonishing was that the Hydro One board also decided to award its own members a raise that would become effective months before an election, when such a move was sure to feed public outrage. Which begs the question: How could an experienced CEO like Schmidt, who had worked in a politically delicate arena before, when he transformed the Saskatchewan Wheat Pool into a publicly traded international success story, not understand what was coming? As these events unfolded, I found myself in a unique spot from which to watch the drama. I not only had ties to the Ontario Progressive Conservatives, but I also happened to be in the final stages of recruitment for a senior position with Hydro One. The PCs had long been aware of the hydro hot button. Former leader Tim Hudak had gone into the 2014 election trying to link power-bill pain to the issue of Liberal corruption around the cancellation of two proposed gas-powered generating plants, but despite the waste of taxpayer's money, it had failed to grab voters. I first observed Ford close up back in 2010, during a Toronto mayoral election campaign when I was media director for candidate Rocco Rossi, one of the losers to Doug's brother Rob. Through the craziness of that mayoral race, I learned that whatever you thought couldn't possibly happen with the Ford family would happen. And what they said they would do, they did do. Over the course of late winter and early spring 2018, meanwhile, I had come to know Hydro One and its executive leadership team. The company was looking for a vice-president of corporate affairs, with responsibility for communications and government relations activities. I was headhunted for the role and as I wound my way through the months-long process, I met with eight senior executives—all of them committed and smart—at Hydro One's concrete-and-glass headquarters across from Toronto City Hall. When I approached Schmidt to ask him to comment for this article, he told me he wasn't able to. But during the interview process, I did spend several hours with him, during which we discussed the role, to be sure, but also the Doug Ford locomotive coming right at him. Mayo Schmidt is a well-known member of Canada’s business community, but he got his start as an American football player. He was born in Kansas and spent much of his time on his grandparents' farm. After college, he was signed as a wide receiver by the Miami Dolphins. He played only one pre-season, though, back in 1980, before choosing business as a career. “I wasn't going to be in the top 2% to 3% of players,” he told The Globe and Mail a few years ago. “It's the same as in business, when you want to be No. 1 or 2 in a sector. If you don't see prospects for growth, you make the adjustment.” Instead, over the next 20 years, he climbed through a series of successful roles at global companies such as General Mills and ConAgra. In 2000, Schmidt was hired as CEO of the Saskatchewan Wheat Pool, which was then near bankruptcy. He exercised tough love at first, slashing debt, staring down creditors and cutting the workforce by more than half. But Schmidt then transformed and expanded the grain handler into a multinational agri-force and renamed it Viterra Inc. in 2007. Five years later, he engineered a sale to Swiss-based commodities giant Glencore PLC for $6.1 billion. This was the track record that attracted the attention of the hiring committee at Hydro One. The ruling Liberal government's in-house business guru, former TD Bank CEO Ed Clark, headhunted Schmidt for the top job. He advised the Wynne government to spin off part of Hydro One in a late 2015 IPO to raise funds for much-needed infrastructure. Clark appreciated Schmidt’s skills as a transformation agent and brisk operator, with a native knowledge of the U.S. marketplace. Schmidt, who was chosen over a field of international candidates for the job, surely knew what he was getting into. As a Globe and Mail article noted at the time, “He will essentially have two sets of bosses—public shareholders and the provincial government, which has proved itself to be an ‘interventionist master.’ “ Schmidt’s salary was not disclosed beyond the statement that it was commensurate with the salaries of the CEOs of other publicly traded utilities—meaning it was far higher than the $745,000 his government-bureaucrat predecessor had earned. Schmidt, whose close-cropped hair, lean figure and steely presence belie a warm and careful personality, took the helm at Hydro One in August 2015. The following November, the IPO of the first 15% tranche of its shares was oversubscribed at $20.50 apiece and raised $1.8 billion. Sales of more shares since then have increased the publicly traded portion to 53%, with the rest continuing to be held by the province. 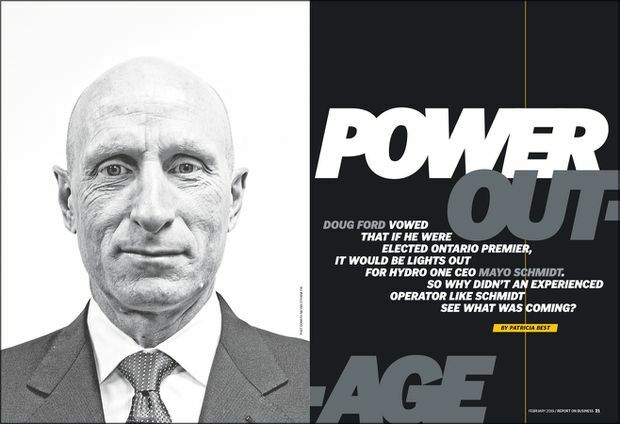 The vision was to transform Hydro One into a customer-focused private company, and to attract institutional investors such as Canada’s big pension funds with a generous dividend and plans to expand into U.S. utility markets, where rate regulation can be more forgiving than in Ontario. As part of that expansion plan, in July 2017 Schmidt announced a $6.7-billion takeover of Spokane-based Avista Corp., which operates utilities in Washington, Oregon, Idaho and Alaska. The deal was not rocket science. In fact, Hydro One was a laggard in the race among publicly traded Canadian utilities to diversify at home and expand aggressively abroad. Halifax-based Emera Inc., Edmonton's Epcor Utilities Inc. and St. John's-based Fortis Inc. had already scooped up assets across North America and in the Caribbean. Hydro One's Avista deal met with some reservations among investors who worried it would dilute earnings and cash flow while increasing Hydro One's debt. It would also reduce the Ontario government's stake to about 42%, although that was immaterial to its clout as the largest single shareholder, with special override powers. As a strategic platform to turn Hydro One into an energy behemoth, however, the deal was a start. The merged company would have a stock market capitalization of more than $15 billion and would potentially form the basis for further expansion. As Hydro One's new leader ramped up the dealmaking, however, Ontario's electricity rates were ramping up too. Between 2008 and 2016, they rose by an average of 71%, compared to a 34% average growth in electricity prices across Canada. Much of the blame for the high rates landed on Hydro One, perhaps because the utility's name is on the bill that is sent to many homes and businesses across the province. Yet it has no control over the cost of generating power and little say on the rates charged to consumers, which are set by the Ontario Energy Board. Perhaps that's why, when Schmidt made his first public statement on the brewing showdown with the Progressive Conservatives, he downplayed the odds that Ford would make good on his threat to fire him and the board. After all, the CEO was operating within his mandate, he was running a publicly traded company and serving his shareholders, and many other Canadian utilities were doing exactly what he was doing. “Cooler heads will prevail,” he said shortly after the election, repeating a line he had used privately in numerous meetings. He could not have been more wrong. “It was easy pickings for us,” says a senior Ford campaign strategist now, explaining how the campaign succeeded by attacking Hydro One and Schmidt. “Entitlement, out of touch, providing a drastic contrast with Ford. It was everything we wanted to talk about.” The first time Ford mentioned the price of electricity in a speech was during a visit to northern Ontario. The crowd reaction was huge—and then it went viral. The release of Hydro One's management information circular just before the Easter weekend provided Ford strategists with even more political gold. It disclosed that in 2017, the board granted Schmidt a salary increase and a $10.7-million poison-pill-like severance package, plus a $25,000 increase in annual fees for the board members in return for their part-time work. For Schmidt and the board, that decision was standard corporate practice. At the time of the IPO, the CEO salary had been pegged cautiously in deference to political optics. The board had then commissioned a study of comparable CEO pay in 2017 to judge the fairness of Schmidt’s compensation package and severance protection. While the directors were at it, they asked compensation consultants to have a look at their own annual fees. What came back was a recommendation to allow increases for everyone based on their mandates, the scope of the company including the Avista acquisition and various performance targets. For the directors, all of them financially well off, the raise after taxes was less than $12,000 a year. The vote was not unanimous, though. Some could see clearly that any raise at all would just give political critics more ammunition. “This was personal for Doug,” recalls the strategist. “It was the single most important issue for voters.” Campaign focus groups showed Schmidt's compensation was the winning hot button, exploiting a general lack of understanding of how hydro rates are set and how negligibly executive pay plays into those rates. The average person felt their hydro bills were subsidizing millionaires, egged on by Ford's messaging. “The millionaires club running Hydro One,” he would say, and it was impossible to make a concise argument in defence. 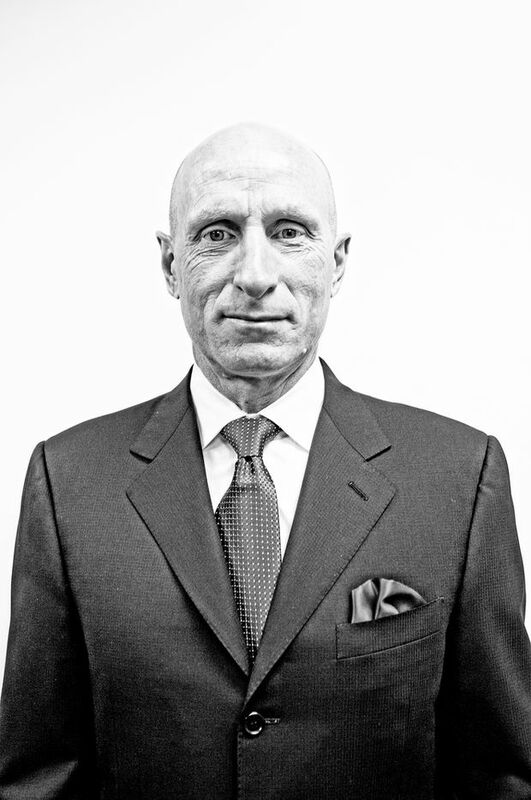 On the warm and rainy day of Hydro One’s annual meeting in mid-May, the strides the utility had made as a privatized entity under Schmidt’s team were on full display. Inside the auditorium at Toronto’s Ryerson University were head office employees, a large contingent of field workers wearing their fluorescent orange work vests, investors and interested onlookers like me. Reporters had been shepherded into an adjacent room to watch the proceedings via a TV feed. Outside the building, on the sodden sidewalk, a gaggle of Doug Ford supporters pumped placards in the air denouncing the $6-million man. During the annual meeting’s question-and-answer session, a succession of stakeholders stepped up to the microphone to offer praise to Schmidt and his team. First up was shareholder Ava Hill, chief of the Six Nations of the Grand River, who gave an eloquent, heartfelt tribute to Schmidt for his sincere engagement with her community. I wondered if the whole thing was a feel-good set-up, but I learned later from credible people outside of Hydro One that the speech-givers were as much a surprise to Schmidt and his team as they were to the audience. Despite heightened security, there was tension in the room. The formal part of the meeting unfolded with the usual orchestrated motions and carrieds. It was the first opportunity for the issue of the executive and board director salary increases to be aired in public and in person. Hydro One’s directors were arrayed along the front row (with the notable exception of former NDP MPP and current independent Senator Frances Lankin). Board chair David Denison played defence. Raises for executives and directors had been in the plan since the IPO, and Denison explained that the board was following a compensation program. He praised Schmidt and his experienced and talented management team. During their relatively short tenure, they had already made significant, tangible improvements to the operations of Hydro One. In brisk fashion, the pay hikes were approved by 92% of shareholder votes cast, with the Liberal government abstaining because of the election. The potential for drama in the room evaporated. It was as if the grassroots outrage about hydro bills and executive compensation didn't exist. In fact, it was only gathering force. Soon after, in early June, Doug Ford’s PCs easily won a majority government. As Ford transitioned into office, Hydro One—which had earlier retained the law firm Fasken to access the help of former Ontario Premier Mike Harris and his former chief of staff Guy Giorno—rallied various friends, allies and consultants, such as former Harper cabinet minister John Baird, to try to influence Ford’s team. But no one succeeded in even getting a meeting with Ford’s transition team. Just to be sure, behind the scenes, Ford and his team were getting ready to exercise the nuclear option if Schmidt and the directors didn't “acquiesce gracefully,” as Teneycke puts it. Officials drafted legislation that would have essentially torn up the employment contracts for Hydro One's executives and directors. In Schmidt's case, that would have deprived him of his $10.7 million in guaranteed severance, as well as stock options and other generous components of his pay package. It also would have made it more difficult for Hydro One to recruit successors. On July 11, at a hastily arranged news conference, Ford declared it a “great day” for Ontario and announced that Schmidt was “retiring” and that the Hydro One board was gone. Schmidt departed that day, taking a retirement compensation package of about $9 million with him, but not the $10.7-million severance package. An entirely new slate of directors was recruited, including Ford government representatives and nominees from institutional investors. Chief financial officer Paul Dobson was appointed caretaker CEO. Perhaps there wasn’t anything that Schmidt or his board could have done to save their jobs, but to many observers, their tone-deaf response to the hydro rate fiasco was mystifying to say the least. Their biggest mistake, perhaps, was their inability to understand that Hydro One is not a true privatized utility. The customer-centric and stakeholder-sensitive approach under Schmidt's new executive team was a breath of fresh air when contrasted with cranky old Ontario Hydro. There was more discipline in the ranks and more transparency to customers. But Schmidt was inexperienced in the arcane regulated electric utility world. Hydro One was not like peers such as Fortis or Emera—it wasn't 100% private, and it hadn't changed its name to shed public expectations associated with a Crown utility. Most of all, there seemed to be little understanding of the nuances of public policy and the political dangers of a parliamentary democracy. It's also possible that Schmidt, accustomed to lifelong success, simply was too caught up in what he was hired to do. He joined Hydro One to transform it. He was hired to take it public and grow its international footprint. He had his focus on the Avista takeover, the first step in his bold plan to turn the company into a shareholder darling. And then there is the Miami Dolphins factor. When I spoke to members of the Ford team, several of them criticized Schmidt for toughing it out and fighting back. They felt it was inappropriate for the head of a ratepayer-supported organization to do such a thing. During one of my meetings with Schmidt, he expressed concern about how effectively the Ford campaign was using social media ads to keep him in the crosshairs. At the time, any search for Hydro One on Google yielded a Ford campaign ad vowing to “clean up the hydro mess.” He asked me what he could do about that. Thinking this was a question testing my skills as a job candidate (and not expecting him to act on my casual advice), I explained how Facebook ad buys worked and how to gain the primary position when an ad pops up on a Google search for Hydro One. (Short answer: outbid them.) Soon after, Hydro One ads began populating search pages, which had the effect of enraging some members of the Ford team. Right up until the end, Schmidt warned privately and publicly that if Ford made good on his threats, it would hurt Ontario's reputation with investors and damage Hydro One's prospects as a publicly traded company. Indeed, last September, the debt rating agency Standard & Poor's downgraded the company's rating, citing government interference in company affairs. In December, Washington state regulators rejected the Avista takeover; more recently, Idaho state regulators did the same. And now a backroom struggle between the two camps on the Hydro One board has unfolded over the hiring of the next CEO. I ran into one of the Schmidt-era board directors recently, part of the slate that voted themselves their election-year raises. He wondered aloud whether the Ford government would be open to selling the remainder of its stake in Hydro One early in its mandate, while it could spend the political capital to raise some much-needed funds. I couldn't help thinking: Doesn't he realize that doing so would be political suicide for Ford the populist? Part of the reason Hydro One became a political football in the first place was because Ontarians don't want their biggest electricity distributor to fall into private hands. But then I asked one of Ford's top advisers and strategists whether Hydro One could one day be 100% publicly traded, whether the government might indeed consider selling it off. His answer surprised me. Turns out, Hydro One had served its purpose. “Definitely possible,” he said. This story appears in the February 2019 edition of Report on Business Magazine.